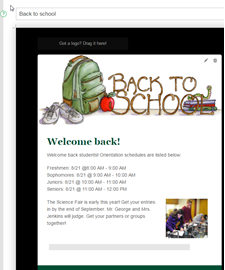 GoDaddy Email Marketing now uses responsive email templates. With the responsive email templates, your emails will automatically scale to fit any screen. Whether it's viewed on a laptop or a smartphone, your campaigns will look great. There's no additional action needed to take advantage of the feature. Recent email campaigns or newsletters you've created appear in the center of the Campaigns page. All others appear under the Compose! button in the sidebar. When you select a campaign, it opens in the center of the Campaigns page. Clone Click to "clone" a campaign, making an exact copy of the campaign in the Campaigns page. GoDaddy Email Marketing adds an incremented number to the campaign title so you know which copy is the clone. Share Click Share to see a list of social media platforms where you can share the campaign. If you've set up the social sharing buttons in the email, you can click any of these to directly share the newsletter on a social network.